Heat oven to 350ºF (325ºF for dark or nonstick cookie sheets). Mix cake mix, butter and egg in large bowl with spoon until dough forms (some dry mix will remain). Shape dough into 1-inch balls. Mix sugar and cinnamon in small bowl. Roll balls in cinnamon-sugar mixture. Place about 2 inches apart on ungreased cookie sheet. Bake 10 to 12 minutes or until set. Remove from cookie sheet to cooling rack. 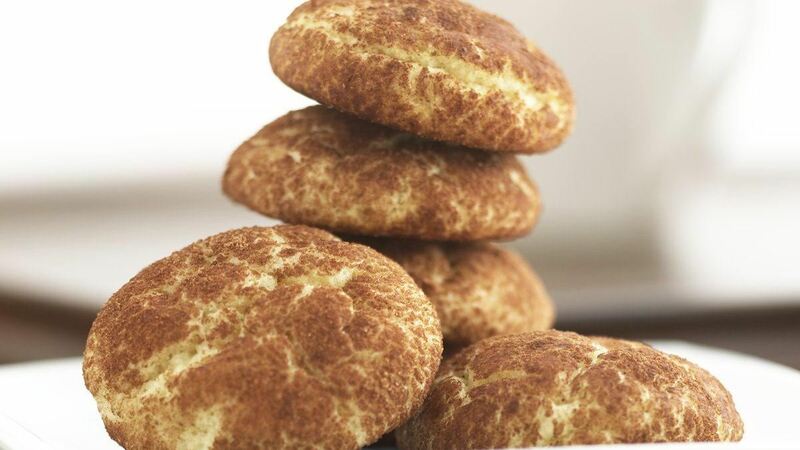 For Larger Snickerdoodles: Shape dough into 1 1/2 inch balls and place them 3 inches apart on the cookie sheet. Bake 12 to 14 minutes. You will get about 26 large cookies. Did You Know? : This sweet little cookie with the whimsical name originated in 19th-century New England and has become an American classic. In this recipe, cake mix provides convenience to the traditional version, but the method of rolling the dough in sugar and cinnamon before baking has been kept.